Is blogging too time consuming? Does blogging not produce good leads? Is blogging dead? Has social media websites like Facebook and Twitter replaced blogs? Whatever negative thoughts you have about dealer blogs, it’s time to reconsider. More than 1/2 of web surfers will read blogs this year. In 2014 blog readership will increase to more than 150 million Americans, or 60% of the internet population in the US. Every blog article is another chance that someone will find your dealership. Having a dealer blog will increase the visits of your website. All of Content Motives blogs have SEO links back to the main dealer websites. 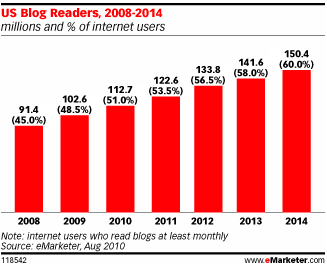 Every year there is a steady increase of blog readers on the internet. So, you cannot afford not to have a blog! With one article post per week, we’re adding 52 new ways for potential car shoppers to find you every year. A blog is the perfect way for your dealership to humanize itself. By having Content Motive update your blog with articles that have personality and high quality content, customers will find your business much more accessible. And of course, blogging will allow customers to put a face on your dealership – potential customers will start viewing your business as a friend with their best interests at heart and look forward to hearing what you have to say. Having a blog is like having a personal relationship with all of its readers. With our constant updates to your blog, readers will begin to view your blog and your dealership as a great source for automotive news. While this won’t happen magically overnight, our steady stream of posts will show readers that you are dedicated and can offer them something very valuable. Our professional writers are knowledgeable of all aspects of the automotive industry. No mater where you are in the dealership industry, an independent, franchise dealer, or a dealer group, a dealer blog is the perfect medium for us to showcase your dealership’s knowledge and can elevate your dealership’s reputation over your competitors. Content Motive’s blog service handles all aspects of your blog. We add new articles every week. All of the articles are keyworded for maximum effect. Our professional writers balance SEO and customer engagement for maximum results. Don’t let your dealership be left in the dust. Having a dealer blog is essential in competing in the automotive industry. Contact us now to get your blog up and running.